Hopefully you are still around to read this :-) Poor you! sounds really rubbish. Does it feel like a really bad case of indigestion? I hope the doctors get you sorted out quick, bringing food back up is no fun, when the experience was so good in getting it down. 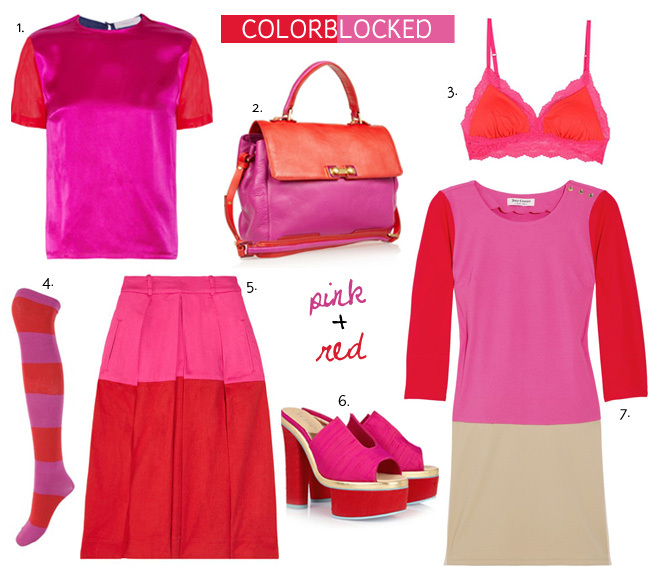 I love, love, love colour so your red/pink combo is completely sold on me. The top is my fave. Did you wind up buying those mint Forever 51 jeans ?? My last medical issue was a miscarriage which was pretty crap back in early Feb but at just 7 weeks, it wasn’t a major thing. But… I had kidney stones about 7 years ago. In the UK, if you don’t pass them in your wee then you go to an outpatients clinic and get them lasered, breaks them up and then you pass them. Not me, got excrutiating pains in my right side and wound up in A&E (ER) on a Friday afternoon. They kept me in all weekend and fitted a stent into my kidney and bladder so I could pass water and then did a scan – I had 3 of the buggers. I’ll try and cut a long story short. I had medical insurance at the time and when the surgeon told me there was a laser treatment waiting list of 6 months and a 50 mile trip to the nearest hospital at least half a dozen times, I called the private surgeon and got myself dismissed from the hospital. I went and saw the private surgeon and it took 3 key hole operations to remove the stones. I was under general anaesthetic 4 times in a 2 week period and it completely finished me off, puking and all sorts. I did lose a stone in weight though! Erin, I think you may regret asking about all our ailments! So sorry to hear about your miscarriage and kidney stone ordeal, Sam – how awful for you! Still, it’s experiences like these that give us perspective and make us more appreciative of the little things. Oh goodness, you poor thing! That all sounds horrible. Way worse than what I’m going through, by far. I’m so sorry about all that. I’ve never had kidney stones or a miscarriage, and I can’t imagine the pain (physical & emotional) that goes along with either. What a tough cookie you are, darling. It’s like Chi said, it give us a nice appreciation for the little things. Take care. Euw those clothes just gave me a headache! I like your new top a lot, but please don’t wear with the rest of those items. And Erin, the endoscopy will be fine, as I told you I had one many years ago and I was fine. I was basically puking up blood for three days solid but didn’t realise. It was black and didn’t look very much like blood. I had a stomach ulcer and was puking so much that I ripped my stomach lining. Nice! Oh but I did have a real proper out of body experience, I passed out and was on the ceiling looking down at myself. It was so cool! Anyway, keep us posted as I’m worried about you, all that stuff does not sound good although it’s probably nothing serious it must feel like it is. Richard had his eyes lasered at Moorfields on Saturday. They cut the flap off his cornea and lifted it up and then stuck a laser in his eye and then stuck it back down. Nice huh? So he’s not feeling too great either. But already he can see better than he has in twenty years and is marvelling at everything. Although he now has the unbridled joy of waking up to me with no make up on and actually being able to see me. Lucky him! Oh lord I’d never wear that stuff all together! Just one piece at a time! I’d make myself nauseous. Your experience sounds awful! Stomach ulcers are no joke. At least you didn’t realize you were coughing up blood, imagine how much scarier it would have been if it looked like blood! But maybe you aren’t terrified of blood the way I am. I think I’d die on the spot or be convinced I had TB if I started coughing up blood. Good thing you got that all taken care of! Endoscopies are very much routine these days so don’t worry. I hope they find the cause and quick. Hope you get better real soon!! Am sure your new top will look great in Europe and congratulations to you and Jennifer for being famous!!! Love the color! I’m really trying to incorporate more color into my wardrobe and not be so dreary! Thanks, Teri! I’m in the same boat! My most recent medical story would have to be the birth of my daughter. Five weeks early. I love that your daughter was almost born in an IKEA! I was early, too, but my mom wasn’t at my favorite store on earth, unfortunately. How cool that WE linked to you! I already waxed poetic about my own ailments on SPL, so I’ll spare you the recap, and just say that I’m happy you made it through with flying colors and your very own “FALL RISK” bracelet! I’m not a huge fan of the color blocking, but I am trying to add more color in my life, so I’ll trust you to forge a path! Erin, feel better soon! Hope they’ll find out the cause of your esophageal problems and be able to fix it soon. Vomiting is one of my big fears, I always feel as if I’m going to die so you have my sympathies. OH, Erin, so the day has come, has it? (Well, come and gone now.) I hope the doctors will finally figure out what ails you and get the issue resolved. It cannot be fun to live life in fear of another attack. With death heavy on your mind, it is a small miracle that you were able to put together this fun and very colorful round up. You’re amazing! Take good care of YOU, my friend. ((hugs)) Make sure to give us an update when you feel up to it.